This example introduces the polarity "Bipolar" - for moving parameters above and below the starting point. Often Destination parameters need to revolve around a central starting point - where you need to increase and/or decrease from the starting value. Bipolar is the parameter that answers this requirement. (Please note: The Live Set that is used in the Mastering MODX series is located here). This allows for movement in either direction from the 12 o'clock position of the Super Knob. In this example, the LFO SPEED is set to a value somewhere between the Minimum and Maximum value. The Classic Flanger's LFO Speed is set to a medium level in the Part Effect window. The full range is from 0.00Hz through 39.7Hz - Using the Bipolar Curve will allow the Super Knob to start at 12 o'clock (64) and increase when turned clockwise and decrease when turned counterclockwise. When you recall this Performance, the Super Knob is stored at the 12 o'clock position - observe how when at straight up at “64”, two sets of 2 LEDs light at the very apex. You will also notice when using a Yamaha FC7 sweep pedal, (Foot Controller 2) to control the Super Knob, you will need to move the pedal past the mid-point to grab the Super Knob. If the pedal is at rest in toe down position, you will need to move it back to "hook" the stored value. Once you pass the ‘stored value’ the pedal will control the Knob as usual. This prevents any jumping of values. The Controller Polarity setting for PART 1 Assign Knob 1 is Bipolar with a linear Ratio +32. Positive values for Ratio will increase when turned clockwise. To verify this let's use the navigation shortcuts to verify the assignments. Hold [SHIFT] + [HOME (INFO)] to view the OVERVIEW screen. Set the PART to "COMMON"
Touch the shortcut box "EDIT COMMON CONTROL SETTINGS" - to see how the parameter is linked to the Super Knob. Press [EXIT] to return to the OVERVIEW screen. Set the PART to "PART 1"
Touch "EDIT PART 1 CONTROL SETTINGS" to ride the shortcut to Part 1's assignment to control INSERT "A" LFO Speed. The Super Knob position 64 (Center) is the start position. When the Performance is stored the current position of the Super Knob is documented. It will correspond to the STORED parameter setting of LFO Speed = 2.69Hz. The Super Knob moved from center to left reduces the LFO Speed from 2.69Hz to the minimum of 0.00Hz. The Super Knob moved from center to right increases the LFO Speed from 2.69Hz to the maximum of 39.70Hz. 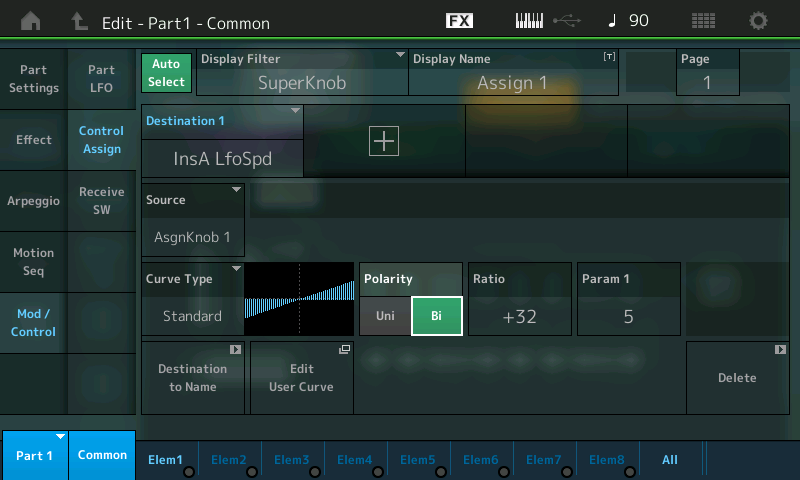 As a result, the Super Knob controls the complete parameter range, as well, just as in the previous Unipolar examples. But the starting point is different. In case of Bipolar the Super Knob works bi-directionally. In the Unipolar examples, the initial setting was the minimum and we could increase the speed and return to the original speed, only; here we can move in either direction from the initial setting. If a specific LFO speed is intended for the basic starting point, using Bipolar might be more useful, because the intended speed will correspond exactly to the center position (Super Knob = 64). Modulations in both directions are possible using Bipolar. But basically the decision for Unipolar or Bipolar will depend on the start position of the Super Knob and the kind of control you require musically. If it starts at left, Unipolar is more useful. If it starts at center position, Bipolar is recommended. Catch up on the previous article in the series - "Mastering MODX: Super Knob Unipolar" here.